You can set the email address where you want to have error message reports being sent to a person in your organization from the Process Options dialog (part of Process Designer). 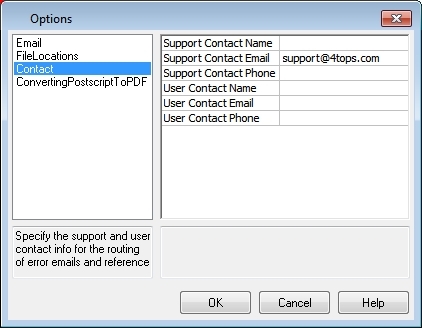 replace the default support address by one of the person in your organization, he can give first line support or decide to forward it to 4TOPS. Note: you may decide this automated error reporting is good for your application too and use our error handler for that purpose. In that case make sure you change this support contact info!